The squirrels must have found a weak spot in the original "armored" feeder because they chewed the hell out of one of the feeder holes. 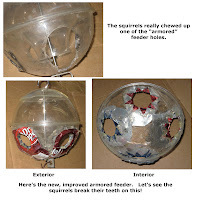 Well, we're ready for them with the new, improved Version 2.0 Armored Feeder! Break your little rodent teeth on this!